ALGIERS. – At least 257 people have been killed after a military plane crashed near the Boufarik airbase outside the Algerian capital, Algiers, according to Algerian state television. The plane, an Ilyushin Il-76, mostly carried soldiers when it went down shortly after take-off yesterday morning, state TV reported. Algeria’s defence ministry was quoted as saying that 247 passengers and 10 crew members were among the dead following the crash. Ennahar TV quoted an Algerian ruling party official as saying that 26 people onboard were members of the Polisario Front, a separatist movement in West Sahara -a territory also claimed by Morocco. “In this painful ordeal, the government members offer their deepest condolences to the families of the victims,” a cabinet statement said. 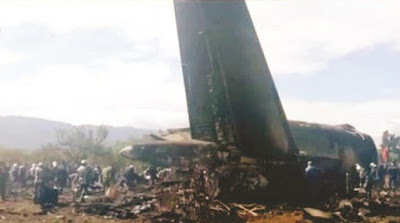 The crash at Boufarik would be the worst in Algeria since 2003 when an Air Algerie jet crashed shortly after take-off from Tamanrasset, killing 102 people. In December 2012, two military jets conducting routine training operations collided in mid-air near Tlemcen, in Algeria’s northwest, killing the pilots of both planes.